Make sure your AirPods are connected to your iPhone or iPad, either when you're wearing them or with the case open and nearby your device. Next to the AirPods in the Bluetooth menu, tap the little "i" button. Select "Left" and "Right" to customize what your AirPods do when you double tap them. Each one can be set to a separate action. Choices include "Siri," which activates Siri, "Play/Pause," which starts or stops a song, "Next Track," which moves to the next track of whatever's being played, and "Previous Track," which goes back to the track that was previously being played. "Off" turns off whatever's playing. Once you have your settings in place, whenever you double tap on an AirPod, it will activate whatever action you chose. With Siri, for example, you can double tap to bring up Siri. 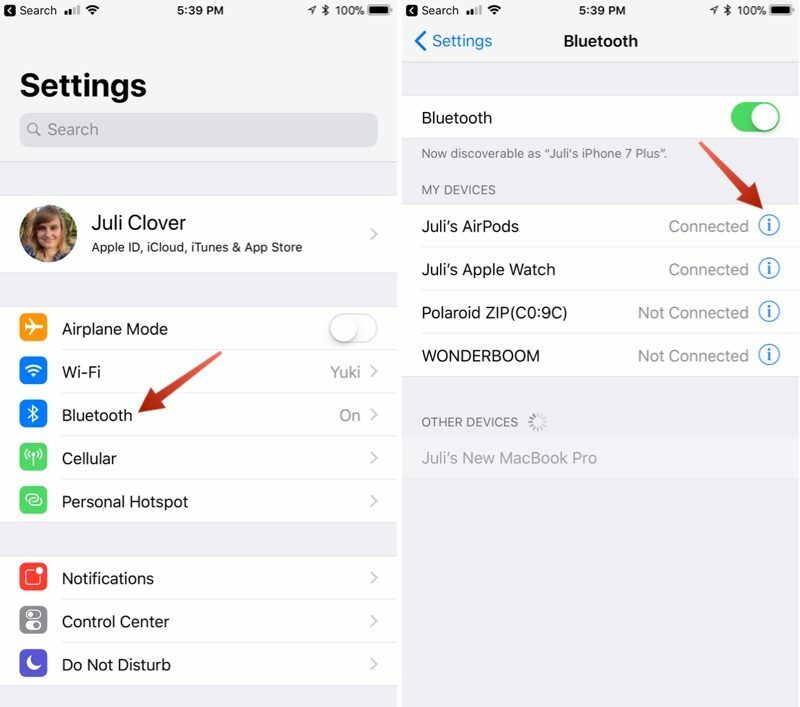 You can also use this AirPods setting menu to change the name of your AirPods, deactivate Automatic Ear Detection and set either the left or right AirPod to serve as a fixed microphone. 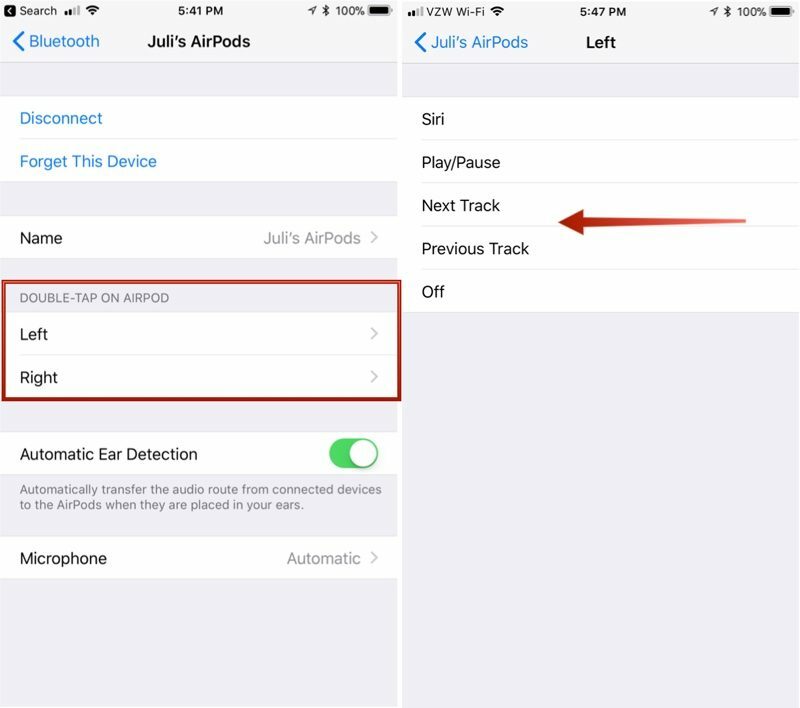 Note: "Next Track" and "Previous Track" are both options that were introduced with iOS 11, so you will need to have iOS 11 installed to see these two AirPods options. Without iOS 11, you can only choose "Siri," "Play/Pause," and "Off." This was already a feature. The only difference is now you can have Siri on one EarPod and track skipping on the other. Very nice add. Next/Previous Song were NOT options before iOS 11. The only options were Siri and Pause/Play. This is the first thing I did when I upgraded my daily-driver iPhone 7 to the GM build last week. I've got left set to Siri, right set to skip forward. I skip tracks 90% of the time, so it makes sense to me to leave Siri available for texting, skipping back, switching playlists, etc. Hopefully in the future they'll add a triple tap option. What I'd like to see is double tap left for back, double tap right for forward, triple tap left for Siri, triple tap right for pause (so I don't have to take my AirPods out of my ears when I've got my hands pretty full checking out at a store or whatever and don't want to drop my AirPod, or I'm in a place where I'd feel weird activating Siri just to pause music). Very useful. I'm going to make my left ear Siri and my right ear skip to next track. I've had my Air Pods for a few days now, but the one thing I wish it had was some sort of volume control slider. I would like to have a strip on the side of the pod where I could raise or lower the volume while I walk around, without having to fiddle with my phone in my pocket. This feature makes me so happy. Set it to previous track. That’s how all podcast players interpret back / forward. I have mine set to next track, and with a few taps I have skipped ahead of the commercials in a podcast. Easy. I’d love to see those extra gestures too. I was thinking they could also do double/triple tapping both AirPods simultaneously as one option for a gesture. Actually, double tapping both at the same time would be a great one for pausing that makes sense for some reason in my mind. This would be especially great if they're unwilling to add a triple tap. I love my AirPods. They’re so cool and have so much potential.